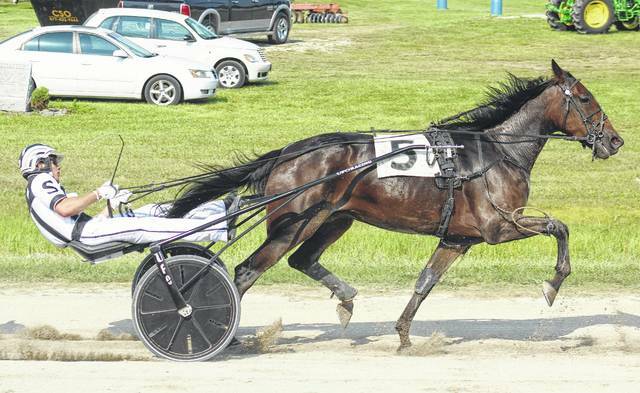 Trevor Smith drives Trynforthefuture in the fifth race at the Fayette County Fair Wednesday, July 19, 2017. Jack Dailey in the sulky of the number four horse, Twinspeak, Wednesday, July 19, 2017 at the Fayette County Fair. Jack Dailey is all smiles as he pulls away from the winner’s circle after his 3,000th career victory driving Twinspeak at the Fayette County Fair Wednesday, July 19, 2017. MILESTONE FOR JACK DAILEY — At right, Dailey is pictured in the winner’s circle with Twinspeak after driving to his 3,000th career victory at the Fayette County Fair Wednesday afternoon, July 19, 2017. 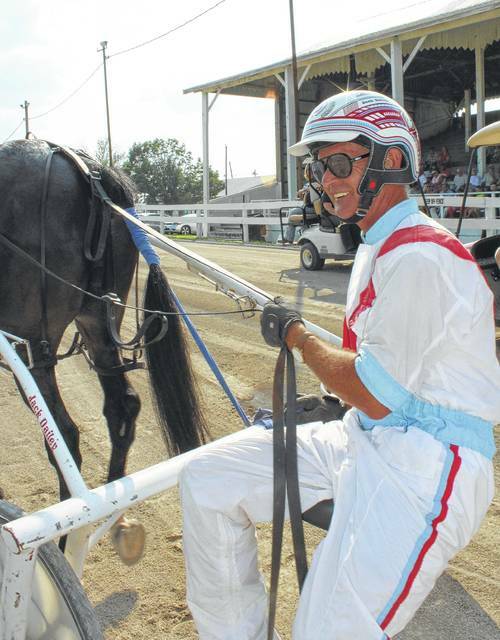 On a hot Wednesday during a hot week at the Fayette County Fair, veteran harness driver Jack Dailey reached a career milestone, winning his 3,000th career race in the sulky behind Twinspeak. Dailey was informed about a month ago that he was nearing the 3,000-win mark for his career. Dailey is a Fayette County native who lives in Jamestown. 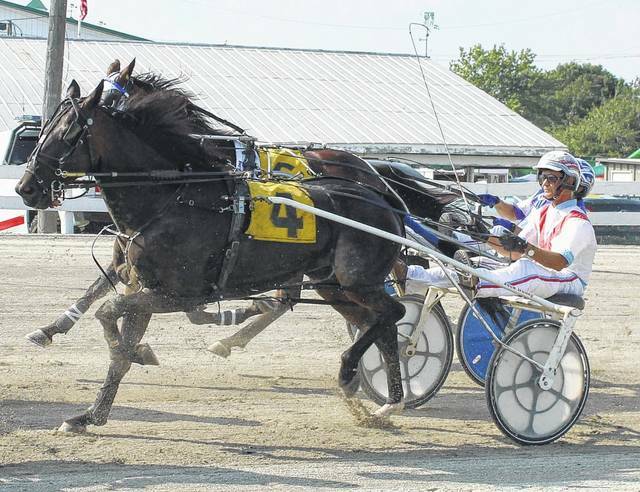 Harness racing continues at the fair Saturday at noon. 4. Two Socks No Pants, Jack Dailey, Earl Owings, 5. Tinhorn Fugue, Tom McRoberts, Tom McRoberts, 6. Thacker, Hunter Myers, Terry Thompson Jr.
https://www.recordherald.com/wp-content/uploads/sites/27/2017/07/web1_Trevor-Smith-2017.jpgTrevor Smith drives Trynforthefuture in the fifth race at the Fayette County Fair Wednesday, July 19, 2017.
https://www.recordherald.com/wp-content/uploads/sites/27/2017/07/web1_Jack-Dailey-back-in-the-pack.jpgJack Dailey in the sulky of the number four horse, Twinspeak, Wednesday, July 19, 2017 at the Fayette County Fair. https://www.recordherald.com/wp-content/uploads/sites/27/2017/07/web1_Smilin-Jack.jpgJack Dailey is all smiles as he pulls away from the winner’s circle after his 3,000th career victory driving Twinspeak at the Fayette County Fair Wednesday, July 19, 2017.
https://www.recordherald.com/wp-content/uploads/sites/27/2017/07/web1_Jack-Dailey-wins-race-No-3000.jpgMILESTONE FOR JACK DAILEY — At right, Dailey is pictured in the winner’s circle with Twinspeak after driving to his 3,000th career victory at the Fayette County Fair Wednesday afternoon, July 19, 2017.